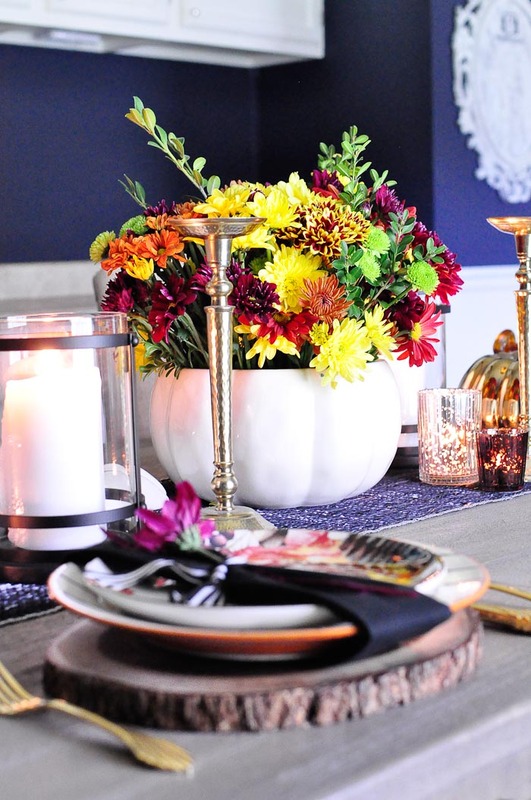 It’s time for fall tablescapes and centerpiece ideas thanks to my collaboration with Better Homes and Gardens, which is available exclusively at Walmart (both in-store and online). Affiliate links are used in this post – thanks for your support! 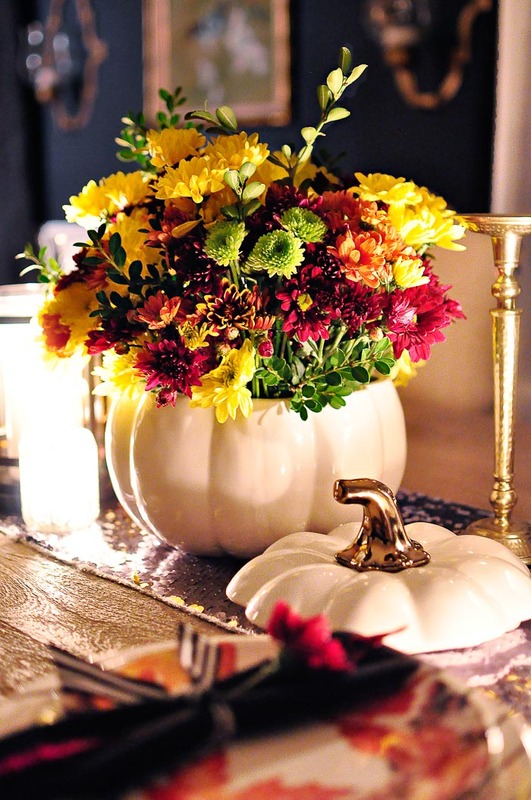 Today I have a beautiful, glam and colorful rustic tablescape filled with wood accents, gorgeous dinnerware, florals and a huge floral pumpkin. What makes a great tablescape that is Instagram or Pinterest worthy? 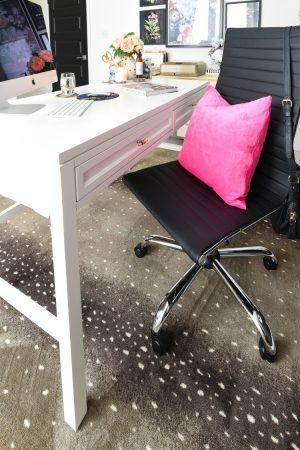 Honestly, I believe it comes down to color, florals, texture, unique dinnerware and a glam factor. I tend to think of it in terms of layers/sections– I need something beautiful for the center of the table and I want each place setting to be functional and swoon worthy for my guests. Step 1: Soak the wet foam in water for 3-5 minutes. Trim to size, if needed, and place into tureen. 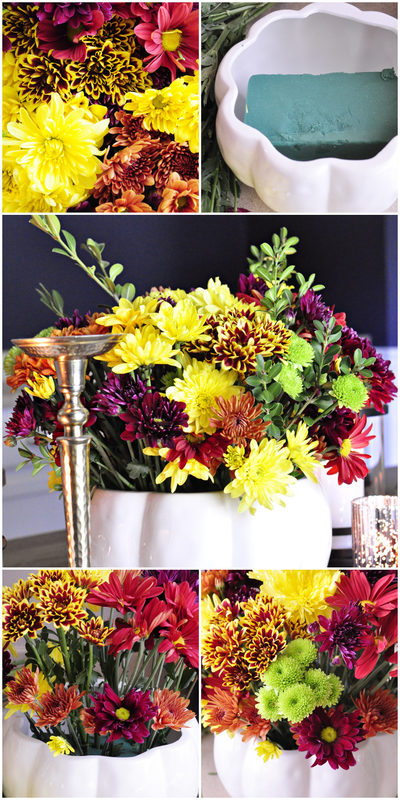 Step 2: Start placing shorter flowers around the edge of the tureen and place taller ones towards the center. Step 3: Fill in the gaps with more flowers, trimming at various heights to create a round and full look. Step 4: Add in greenery (I used some trimmings from my boxwoods) and place on table. 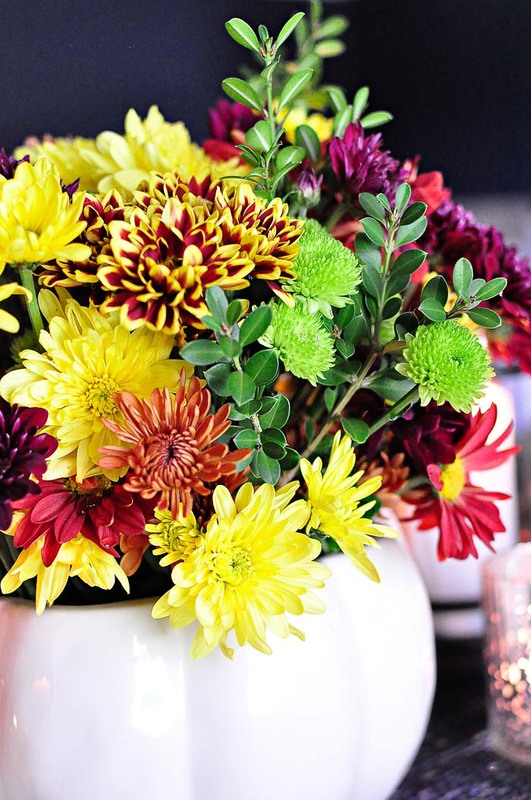 I love all the texture and color the florals add to the table. 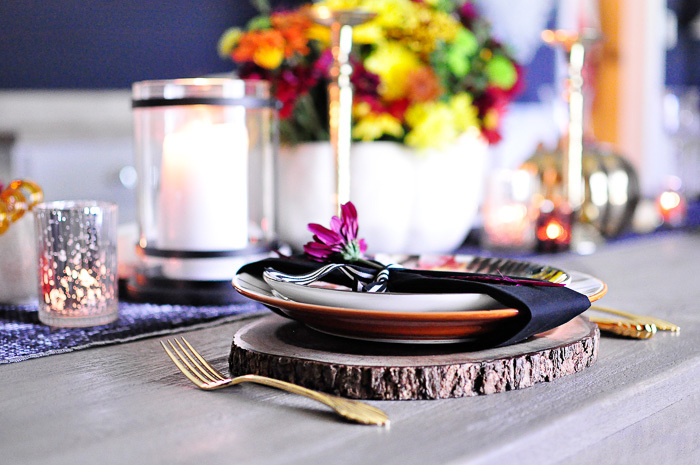 Up next…functional and glam place settings. I got all new stuff for these place settings, and I’m excited to have new dinnerware and chargers to mix and match. I bought the Better Homes and Gardens Acacia Wood Bark Chargers, Sabin Striped Dinner Plates, and Leaf Salad Plate Set for this look. The wood chargers are gorgeous and each one is uniquely shaped and different. 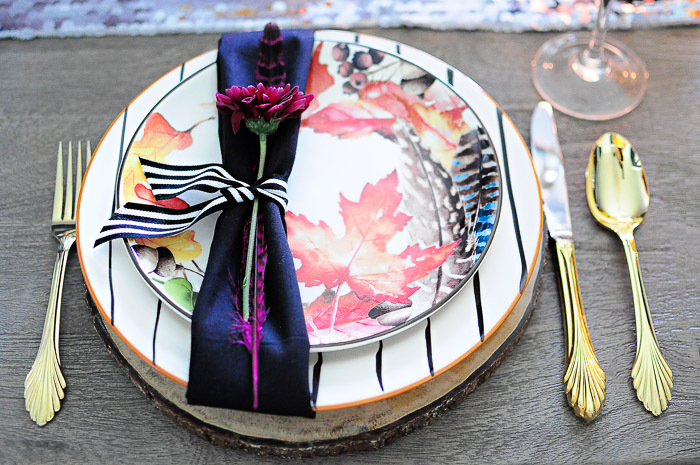 They also add a bit of height to the place setting, and the wood bark edge is so lovely and rustic. The striped plate and leaf plate are unique and versatile dinnerware pieces that look great on their own or layered with other pieces you may already own. 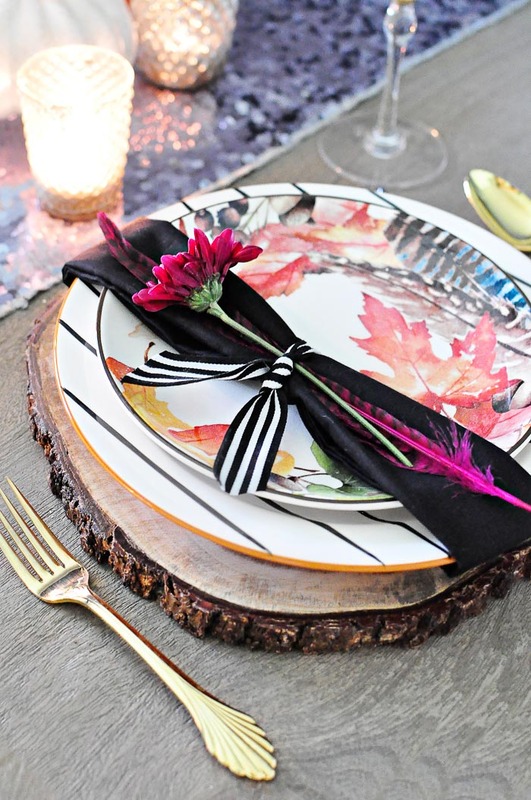 I paired a simple black napkin folded under the plates and accented with a craft feather and flower cinched with a black and white striped ribbon. My vintage gold flatware looks shiny and pretty next to my new Better Homes and Gardens items. 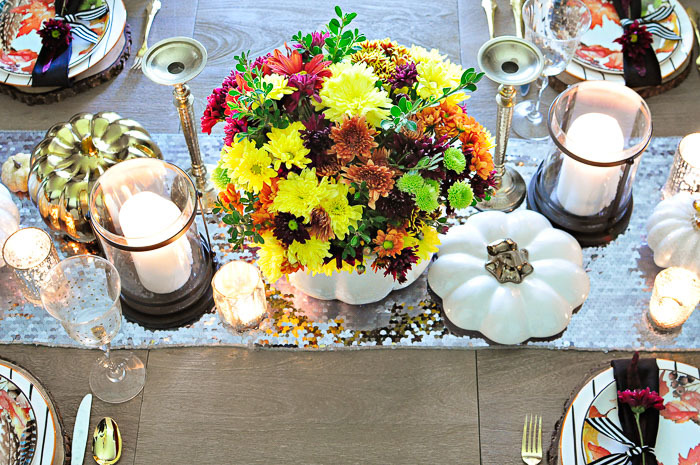 When you put all these elements together, you end up with a rustic glam fall floral tablescape perfect for Thanksgiving dinner or a fall dinner party. I added some candles to accent all the sparkly elements on the table. There’s still plenty of room for large serving dishes for a family style meal. 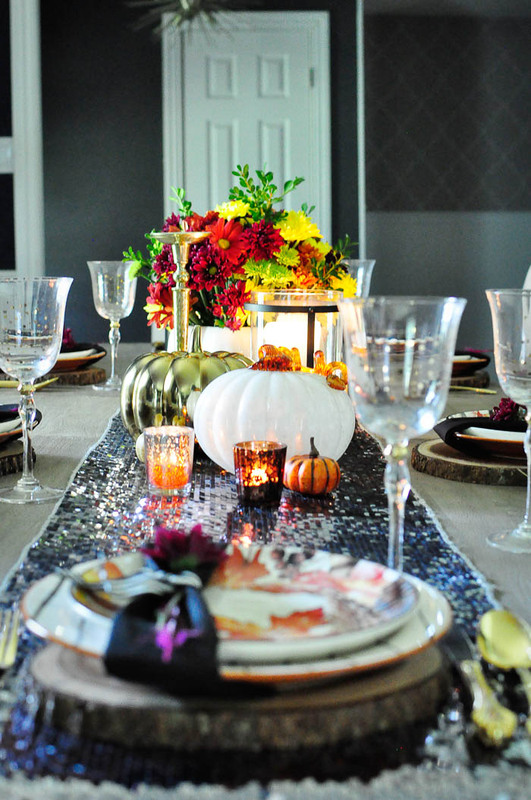 And at night, this tablescape is so cozy and glam. I think this may be my most favorite centerpiece/tablescape I’ve ever made. It was so fun putting this all together. 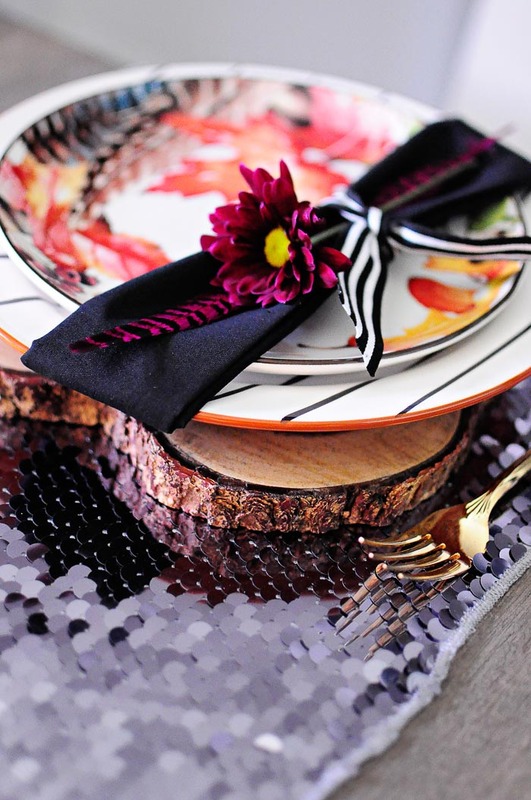 I simply love fall colors and decor. 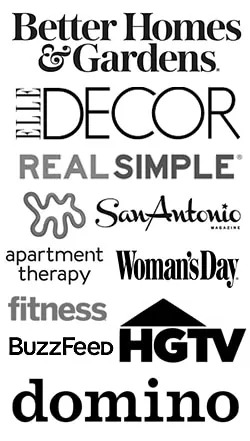 I need to have some people over so I can put all these gorgeous Better Homes and Gardens items to use. I’ll be back on Wednesday with an update about selling our house along with a list of things we did before we even listed our house on the market. Thanks for all your feedback in my post last week! xo. 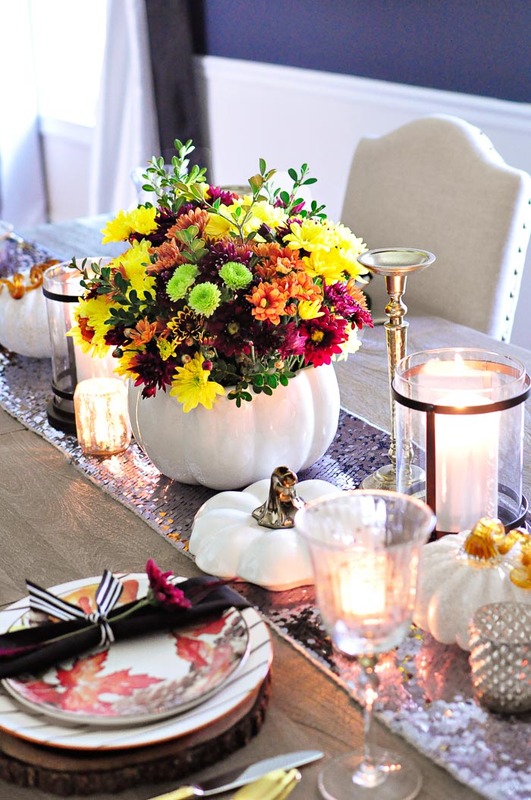 What are your favorite decor/tabletop items to use for fall centerpieces? 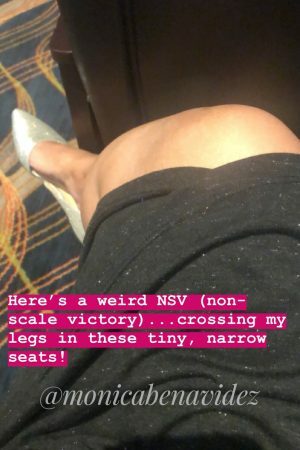 Wowzers!! Such pretty, rich lush colors. Looking gorgeous. Gorgeousness Monica! 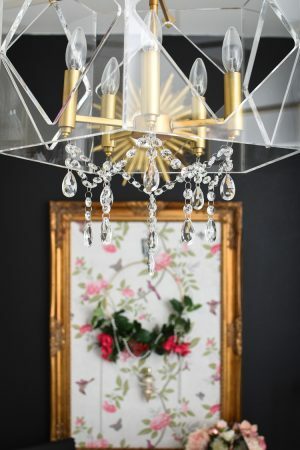 I love your use of all those rustic pieces and you still kept it glam! 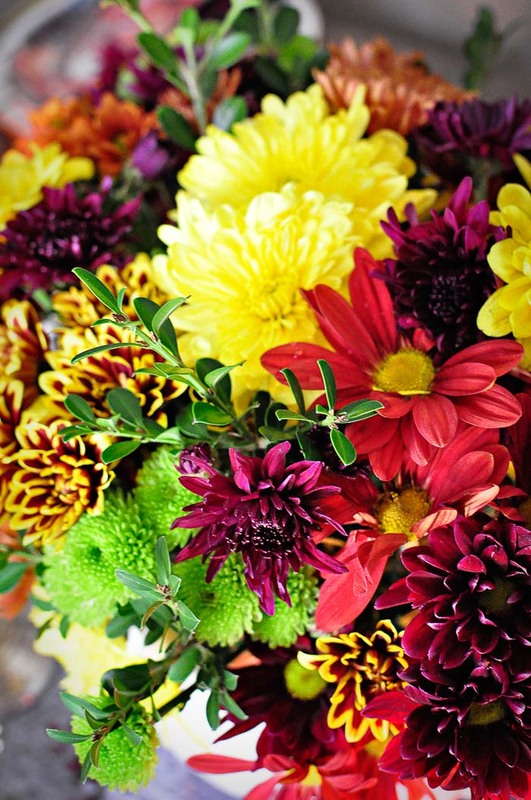 Colorful, beautiful, and definitely a table I'd love to share a meal. Oh so pretty, you do really set a stunning table.